Price is an important element of the marketing mix. It can be used as a strategic marketing variable to meet competition. It is also a direct source of revenue for the firm. It must not only cover the costs but leave some margin to generate profit for the firm. However, price should not be so high as to frighten the customers. Price is also an element which is highly perceptible to customers and significantly affects their decisions to buy a product. In general, price directly determines the quantity to be sold. Pricing decisions are usually determined by demand, competition and cost. We shall discuss each of these, factors separately. We take demand first. The popular ‘Law of Demand' states that "higher the price; lower the demand, and vice versa, other things remaining the same’’. In season, due to plentiful supplies of certain, agricultural products, the prices are low and because of low prices, the demand for them increases substantially. You can test the validity of this law yourself in your daily life. There is an inverse relationship between price and quantity demanded. If price rises, demand falls and if the price falls, the demand goes up. Of course, the law of demand assumes that there should be no change in the other factors influencing demand except price. If any one or more of the other factors, for instance, income, the price of the substitutes, tastes and preferences of the consumers, advertising, expenditures, etc. vary, the demand may rise in spite of a rise in price, or alternatively, the demand may fall in spite of a fall in price. However, there are important exceptions to the law of demand. There are some goods which are purchased mainly for their ‘snob appeal'. When prices of such goods rise, their snob appeal increases and they are purchased in larger quantities. On the other hand, as the price of such goods falls, their snob appeal and, therefore, their demand falls. Diamonds provide a good example. In the speculative market, a rise in prices is frequently followed by larger purchases and a fall in prices by smaller purchases. This is especially applicable to purchases of industrial raw materials. More important than the law of demand is the elasticity of demand. While the law of demand tells us the direction of change in demand, elasticity of demand tells us the extent of change in demand. Elasticity of demand refers to the response of demand to a change in price. It is necessary for the marketer to know what would be the reaction of the consumers to the change he wishes to make in the price. Let us take some examples. Smokers are usually so addicted to smoking that they will not give up smoking even if prices of cigarettes increase. So also the demand for salt or for that matter of wheat is not likely to go down even if the prices increase. Another example of inelastic demand is the demand for technical journals, which are sold mainly to libraries. On the other hand, a reduction in the price of television will bring in more than proportionate increase in demand. Some of the factors determining the price-elasticity of demand are the nature of the commodity, whether it is a necessity or luxury, extent of use, range of substitutes, urgency of demand and frequency of purchase of the product. The concept of elasticity of demand becomes crucial when a marketer is thinking of lowering his price to increase the demand for his product and to get a larger market share. If the increase in sales is more than proportionate to the decline in price, his total sale proceeds and his profits might be higher. If the increase in sales is less than proportionate, his total sales proceeds will decline and his profits will definitely be less. Thus knowledge of the elasticity of demand for his products will help a marketer to determine whether and to what extent he can cut the prices or pass on the, increase in costs to the consumer. It may also be noted that the price elasticity of demand for a certain commodity and the price elasticity of demand for a certain brand of that commodity may be radically different. 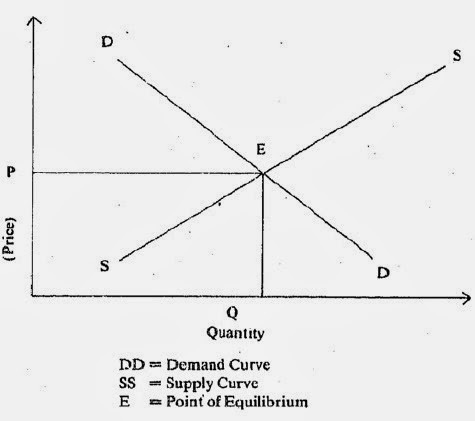 For example, while the demand for cigarettes as such, may be highly inelastic, the price elasticity of demand for Four Square or Charrhs' may be highly elastic. The reasons for this are weak brand loyalty and the availability, of substitutes. The degree of control over prices which the sellers may exercise varies widely with the competitive situation in which they operate. Sellers operating under conditions of pure competition do not have any control over the prices they receive. A monopolist, on the other hand, may fix prices according to his discretion. Sellers operating under imperfect competition may have some pricing discretion. The marketer, therefore, needs to know the degree of pricing discretion enjoyed by him. Let us take. up each of these cases individually. Perfect competition is said to exist when (i) there are a large number of buyers and sellers, (ii) each purchasing and selling such a small quantity that their withdrawal from the market will not affect the total demand and supply, (iii) the products sold by sellers are homogeneous in nature. Under monopoly, a single producer has complete control of the entire supply of a certain product. Railways and electricity are examples of monopoly. The main features of monopoly are (i) there is only one seller of a particular good or service and (ii) rivalry from the producers of substitutes is so remote that it is almost insignificant. As a result, the monopolist is in a position to set the price himself. Thus, he is in the position of a Price Setter. However, even in the case of monopoly, there are limits to the extent to which he can increase his prices. Much depends on the elasticity of demand for the product. This, in turn, depends on the extent of availability of substitutes for the product. And in most cases, there is rather an infinite series of closely competing substitutes. Even railways and electric supplier organisations must take into account potential competition by alternative services-railways may be substituted by motor transport and electricity may be by individual Solar electricity units. The closer the substitute and greater the elasticity of the demand for a monopolist's product, the less he can raise his price without frightening away his customers. Similarly high price of oil has led to development of alternative sources of energy. (i) Shifts in consumer demand, (ii) continuous process of innovations and technological developments leading to development of substitutes, (iii) lack of stimulus to efficiency provided by competition, (iv) entry of new competitors, and (v) intervention by governments. Oligopoly is a market situation characterised by a few sellers, each having an appreciable share in the total output of the commodity. Examples of oligopoly are provided by the automobiles, cement, tyre, infant food, dry batteries, tractor, cigarettes, aluminium and razor blades industries. In each-of these industries, each seller knows his competitors individually in each market. Each oligopolist realises that any change in his price and advertising policy may lead rivals to change their policies. Hence, an individual firm must consider the possible reactions of the other firms to its own policies. The smaller the number of firms, the more interdependent are their policies. In such cases, there is a strong tendency towards close collaboration in policy determination both in regard to production and prices. Thus, oligopolists follow the philosophy of ‘live and let live'. Two examples of this may be mentioned here. In response to tenders invited by the Director General of Civil Supplies and Disposals, the three principal manufacturers of storage batteries, viz. Chloride India, Standard Batteries and AMCO Batteries, quoted almost identical prices. Oligopolistic industries are usually characterised by what is known as price leadership - a situation where firms fix their prices in a manner dependent upon the price charged by one of the firms in the industry, called the price leader. The price leader has lower costs and adequate financial resources, a substantial share of the market and a reputation for sound pricing decisions. Price leaders with the strongest position in the market may often increase their prices with the hope that competitors will follow suit. Price followers may delay raising their prices in the hope of snatching a part of the market share away from the leader. Monopolistic competition is a market situation, in which there are many sellers of a particular product, but the product of each sellers is in some way differentiated in the minds of consumers from the product of every other seller. None of the sellers is in a position to control a major part of the total supply of the commodity but every seller so differentiates his portion of the supply from the portions sold by others, that buyers hesitate to shift their purchases from his product to that of another in response to price differences. At times, one manufacturer may differentiate his own products. For example, a blade manufacturer in lndia manufactures more than 25 brands of blades. This differentiation of product by each manufacturer by giving it a brand name gives him some amount of monopoly if he is able to create a goodwill for his product and he may be able to charge higher prices thereof to some extent. Still, his product will have to compete with similar products of other manufacturers which puts a limit on his pricing discretion. If he charges too high a price, consumers may shift their loyalty to other competing suppliers. You can find it out yourself by going to the market, as a large number of consumer goods like toothpastes, soaps, cigarettes, radios, etc. are subject to a large degree of product differentiation as a means of attracting customer. As long as a consumer has an impression that a particular product brand is different and superior to others, he will be willing to pay more for that brand than for any other brand of the same commodity. The differences real or illusory, may be built up in his mind by (a) recommendations by friends, (b) advertising, and (c) his own experience and observation. The producer gains and retains his customers by (a) competitive advertising and sales promotion, (b) the use of brand names quite as much as by (c) price competition. Product differentiation is more typical of the present day economic system, than either pure competition or monopoly. And, in most cases, an individual firm has to face monopolistic competition. It tries to maintain its position and promote its sales by either (i) changing its price and indulging in price competition, or (ii) intensifying the differentiation of its product, and/or (iii) increasing its advertisement and sales promotion efforts. There is a popular belief that costs determine price. It is because the cost data constitute the fundamental element in the price setting process. However, their relevance to the pricing decision must neither be underestimated nor exaggerated. For setting prices, apart from costs, a number of other factors have to be taken into consideration. Demand is of equal, and, in some cases, of greater importance than costs. An increase in cost may appear to justify an increase in prices yet the demand situation may not permit such an increase. On the other hand, an increase in demand may make increase in prices possible, even without any increase in costs. Very often, price determines the cost that may be incurred. The product is tailored to the requirements of the potential consumers and their capacity to pay for it. The radio manufacturers in India realised that if they have to capture the mass market prevailing in India, they have to price it at low level which could be done only by reducing costs-reducing the number of wave-bands in the radio. And now a single wave radio is available at around Rs. 100. Given the price, we arrive at the cost working backwards from the price consumers can afford to pay. Over a period, cost and quality are adjusted to the given price. If costs were to determine prices, why do so many companies report losses? There are marked differences in costs as between one producer and another. Yet the facts remains that the prices are quite close for a somewhat similar product. This is, if anything, is best evidence of that costs are not the determining factor in pricing. Price decisions cannot be based merely on cost. It is very difficult to measure costs accurately. Costs are affected by volume, and volume is affected by price. The management has to assume some desire price and volume relationship for determining costs. That is why costs play even a less important role in case of new products as compared to existing products. It is not possible to determine costs without having an idea of what volumes or numbers can be sold. But, since there is no experience of volumes, costs and prices, one starts with the going market price for similar products. All this discussion does not purport to show that costs should be ignored altogether while setting prices. Costs have to be taken into consideration. In fact, in the long-run, if costs are not covered, manufacturers will withdraw from the market and supply will be reduced which, in turn, may lead to higher prices. The point that needs emphasis is that cost is not the only factor in setting prices. Cost must be regarded only as an indicator of the price which ought to be set after taking into consideration the demand, the competitive situation, and other factors. Costs determine the profit consequences of the various pricing alternatives. Cost calculations may also help in determining whether the product whose price is determined by its demand is to be included in the product line or not.